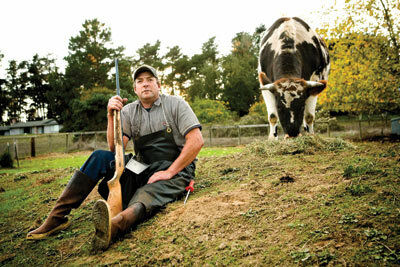 There are only a few ways to legally kill a farm animal in California.One-Shot Johnny is one of them. THERE IS A CREEK CALLED PIETA in the Alexander Valley, Sonoma County, beside which John Taylor lives with his family. John is alternately called J.T. or One-Shot J.T., after personalized license plates he was given for a birthday a dozen years ago. 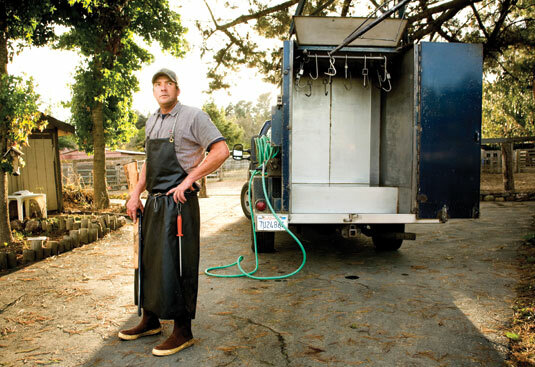 By whatever name, John is one of the only custom animal slaughterers in California. The plates represent the only advertising John does in the world; he doesn’t need business and he eschews press. Functionally, John’s work is essential, the only option ranchers have if they want to slaughter an animal without loading it into a trailer and driving it hundreds of miles for its first and last road trip, to be killed at a slaughterhouse. Formally, what he does squats between marginal and obsolete. John is a one-man mobile slaughterhouse. There are three ways to slaughter an animal in California — speaking legally, not practically. A rancher can take his wards to a USDA-inspected slaughterhouse, of which there are two in the northwestern counties of Marin, Sonoma, Napa, Lake, and Mendocino. The fivecounty area makes up 1,567 square miles, so the drive can be anywhere from 60 to 600 miles, round trip. In order to sell individual cuts of meat — a rib-eye, a pork loin, a rack of lamb — a farmer must make that costly drive. The costs of such a trip rise in indirect proportion to the size of the animal operation: Per-mile gas costs fall as the number of animals in a trailer rises and, more subjectively, with the greater likelihood of a third party driving, with less emotional stake in the trip. The bureaucratic mechanism available at a USDA slaughterhouse — the presence of a hard-hatted federal employee with yea-ornay power — though, is the gateway to the commercial sale of meat. Custom slaughter is the second and third way to turn animal to meat. There are 42 custom slaughterhouses in California, none of which can legally serve the retail market. They kill animals for consumption by their legal custodians, either the farmers who raised them or customers who bought the whole animals, at least on paper, while they were still alive. None of these facilities exist in the five counties where John Taylor works. Hiring him to slaughter a farm animal at the ranch is the third way. John is a one-man mobile slaughterhouse. His custom-built rig supports a boom in its bed, with a long hook on its end from which carcasses can be hung to bleed. In his cab, he carries all the necessary tackle: a sightless .22 rifle, a bone saw, a scalding vat, and knives. The conditions for employing John’s services are the same as those concerning non-USDA slaughter. Any animal he kills must be returned to its owner. Nose to tail, it must go back to whomever holds the deed to its life. While 50 years ago there were over 20 slaughterhouses in Northern California, including USDA and state-inspected (which cannot sell across state lines), the consolidation of animal agriculture that has occurred over that time means that any rancher who has sold an animal — at its live weight — to a customer, or wants to harvest one for his own larder, most likely will schedule a visit with John, who will discharge and move a carcass for under $100: $20 for a lamb, $50 for a pig, and $70 for a cow. By John’s admission, he could charge twice that. His field is bleakly populated. He tells a story of sitting down with a colleague named Angelo Ibletto, another, now-retired, custom slaughterer who was harvesting animals when John was still sweeping sawdust off his uncle’s butcher shop floor. For a lark, they counted “cut-and-wrap,” or local butcher, shops that had closed in the 23 years they’d both been on the job. They came up with 23, naming the only five left in Sonoma county: Bud’s Meats in Penngrove, Broadway Market in Sonoma, Ibletto’s in Cotati, Martindale’s and Willowside Meats in Santa Rosa. As circumstance would have it, one of the five, Willowside, belonged to John’s uncle and father — from whom John inherited his occupation and his custom truck, the body of which dates back to 1971. Though John’s family sold Willowside in the early 1980s, foreseeing the decline of local ranching, the store remains intact and in business, faithfully run by Don Albergi, who started working at the store in 1986 and bought it in 2002. Talking to John Taylor, one is struck by the symmetry between his livelihood and that of the farmers whose animals he kills. Like any full-time, small-scale farmer today, John is a relic of a preindustrialized world; both he and the farmers suffer the fate of heretics, pitted against economic efficiencies that our society treats as orthodoxies. The farmers, ranchers, and reapers who dot the Northern California landscape remain duty-bound to their harvests for livelihood and legacy, dependent on one another to uphold the crumbling infrastructure of their local industry. Though John Taylor snorts when I call him an activist, he acknowledges that his prices are fixed to encourage the survival of family farms. If he raised his prices, he maintains, he would be cash-rich but spirit-poor and out of work in five years: When farming is curtailed by high costs, neighbors start returning developers’ phone calls. Knackery is a close relation to ranch-slaughter: Knackermen dispatch dead or dying farm animals and sell the meat and hides — an early form of recycling. Like gravediggers, they are rewarded for their labors with, at best, invisibility and, at worst, contempt. Though John’s job does not effect a hastier exit than nature would have on its own for an animal in extremis, he completes a cycle that our consciences deny, and identifies himself as a practitioner of the knackery trade. Knackermen do the dirty job of turning horses to glue, and John does the dirty job of turning animals to meat, assuming stewardship for the final stage in not one or several but hundreds or thousands of animals’ lives each year. There are some facts we seem very willing to deny: Magazine clippings don’t magically adhere to the page, nor does a lamb chop magically appear on a plate; glue is a fact, as is animal husbandry, as is slaughter (hunting, incidentally, preserves some lyrical value, which seems to exempt it from the same repudiation). One of the finest maneuvers of the companies that vertically integrated our meat industry was their elegant separation of agriculture from its landscape. With so few reminders of troubling facts — other than for the inhabitants of Tar Heel, North Carolina, or one of the small Arkansas towns that hosts Tyson chicken houses — whom are we to blame for our dispassion? And what would we display, beyond shock, if we were faced with the sights, sounds, and smells of animal production again? John halfheartedly trots out accounts of insults hurled and calls made by drive-by Samaritans who have passed his truck and “seen things they didn’t want to see.” There is no great mystery to the truck’s contents on its trip from ranch to butcher: It contains a carcass, fruits of a year’s — or more — hard labor. I listened, in late October, to John’s despairing view of our food system’s future. He weaved a Saramago-esque tale of hungry city dwellers flocking to riverbanks and anxiously pondering the waters’ depths, baffled at how to plumb them for fish, or gathering in droves on suburban streets to stare glumly at manicured lawns, powerless to summon squash and beans from them. I sadly nodded along with him, thinking, for a minute, of the other Pietà, the cool white sculpture of the Virgin Mary holding a crucified Jesus in a basilica in Vatican City. It is an inane metaphor: Between us and our dwindling agricultural knowledge, who is the Virgin and who is Christ? But something nags at me as I try to shake the image. It is not the thematic continuity between one slaughter and another that resonates, but the paradoxes of each. In Michelangelo’s Pietà, Mary doesn’t mourn; her grief is displaced by some invisible peace, some knowledge of her role in the inevitable. John, on whose gentle skill hundreds of farmers depend, possesses noble doggedness in persisting in his vanishing trade. Calmly, he aims, again, and again takes the shot. I realize I am writing an elegy for the knackerman. TAMAR ADLER recently left her job cooking at Chez Panisse in Berkeley to think and write about food policy. She was formerly an editor at Harper's Magazine, in New York, and the head chef of a farm-based restaurant called Farm 255 in Athens, Georgia. When he's not photographing meat and meat lovers, JULIO DUFFOO spends his time traveling and photographing landscapes and almost anyone who will stand in front of his lens. A Peruvian native, he was raised in Brooklyn and lives in San Francisco. This article originally appeared in Meatpaper Issue Six.